Chef Quique Dacosta pushes the limits of the culinary arts. In southern Spain, in the coastal port town of Dénia, I was recently instructed to eat my napkin. The venue was the Michelin 3-star restaurant named after chef Quique Dacosta, a modern-day pillar of Spanish avant-garde cuisine. 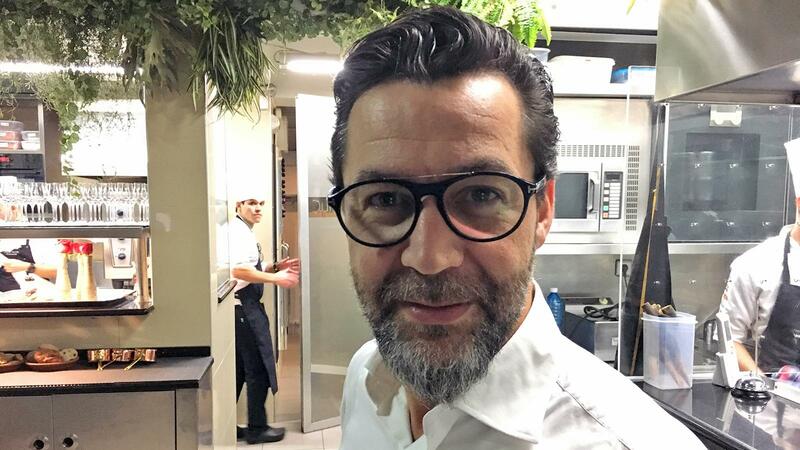 Though Dacosta, 47, has five restaurants and bars in the Valencia area, this 30-seater is his most daring—and expensive, with long tasting menus priced at 210€. Here in the sleek, white interior decorated with modern sculptures that look like they were inspired by a kid’s toybox, a server laid a small plate in front of me. On it, was one folded white napkin. “Do not open the napkin yet,” the server cautioned. He waited until a similar napkin was placed in front of each of my fellow diners. In the center of the table, he placed a platter that bore what appeared to be a sizable wheel of a red-rind cheese in a cloth, flanked by slices of black truffle. The course was called “Napkin Cheese,” so I assumed we would be dividing up local rustic sheep’s milk cheese with pieces of Dacosta’s housemade breads and some local Alicante wines. Add the truffle and … yumm. But I was wrong. The cheese wheel on the table was a prop—not for eating. “You may open your napkins now,” the server announced. I unfolded the white linen and inside was what appeared to be another smaller, cream-colored piece of fabric—about three inches square. As the server spoke, I realized that this square was the cheese. Not just any cheese, but a cheese that seemed to have been formed into a light edible textile (with the help of rice starch). What’s more, the server told us this cheese/napkin was mainly meant to be experienced for its texture, accompanied by a shaving of truffle. On the night I visited, Dacosta’s “Evolution and Origin” tasting menu included six “acts” totaling about 20 small dishes—from soft-shell rock crabs served on a “beach” of edible sand to a creamy rice cooked with eel to tender glazed slices of duck to a trio of desserts sprinkled with lots of flower petals. I’ve eaten a lot of different—from faux “olives” containing martinis to foie gras in the form of an ice cream bar to mozzarella blown into a bubble. But “Napkin Cheese” was in a class of its own. I picked up the square, bit off a corner and chewed. Napkin, amuse bouche, or work of art? It had little taste. But it felt like a fabric—one that dissolved in the mouth with a bit of masticating. The grown men around the table giggled like school kids as we ate our napkins. There was something just so odd about the experience, we couldn’t help ourselves. In the days and weeks that followed, the dish haunted me. Was it food? What are the limits of the “culinary arts”? Is the purpose of modern cuisine to nourish us like our grandmothers? To wow us like our first love? Or to illuminate us like our favorite teacher? Can it also tease and provoke? Or even make edible puns? Any cuisine that stops experimenting feels dull or dead. But too much innovation can feel too cerebral or cold. The beauty of such an experience is that you never forget it. Or at least you won’t until the next dish that rocks your world. Who knows what that will be. But I’m interested. After all, he got me to eat my napkin.